The app will show up inside of the Newsstand app as the latest magazine cover or a blue icon. You can login under the settings (gear) icon as explained HERE. We also have an app for Rivals members (BlueandGold.com) for iPhones and Android here: //bluegoldonline.com/go-to-blueandgold-com/ This app will appear as a blue Rivals logo on your device home screen, which is how you can tell that it is not the magazine app. NOTE: The login for BlueandGold.com app requires a paid membership with Rivals. However, there are some free articles on there too, and the recruiting database, rosters and schedules are all available without a login. There are even several free message boards, if you would like to chat with fellow fans. 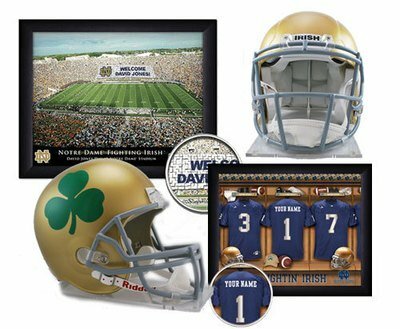 NextGreat gifts for your Notre Dame fan!